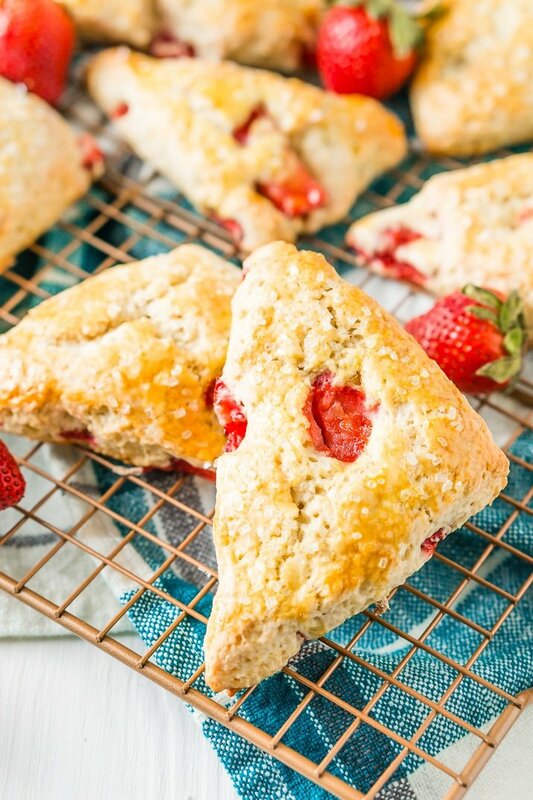 These Strawberry Scones are loaded with fresh, juicy berries and a hint of lemon zest. They’re simple to make and a classic breakfast or light treat for spring and summer! Maine summers are notoriously short, and although it seems like it will never arrive this year, I plan on enjoying as many seasonal flavors as possible! That’s why I’ll have this Strawberry Scones recipe on rotation from now to September. I go strawberry picking every year, and in addition to enjoying them on their own, I love saving a pint or two for recipes! There’s nothing like the taste of fresh-picked strawberries in these scrumptious scones, but until the season rolls around, store-bought berries will do just fine. JUST TAKE ME TO THE STRAWBERRY SCONES RECIPE ALREADY! 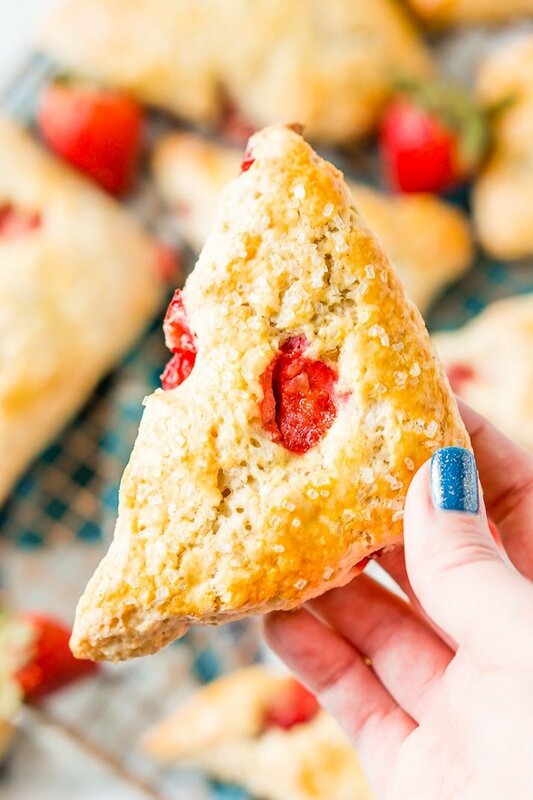 If you’d rather skip my (very helpful, I think) tips and tricks, essential cooking info, and similar recipe ideas – and get straight to this deliciously easy Best Ever STRAWBERRY SCONES Recipe – simply scroll to the bottom of the page where you can find the printable recipe card. And if you’re a rhubarb fan – maybe you have some growing in your garden – you can adjust the recipe to make Strawberry Rhubarb Scones! Just use equal parts fresh rhubarb and fresh strawberry instead of all strawberry. Scones are a tasty, light, and not-to-sweet breakfast or snack to enjoy with your morning cup of coffee or your afternoon tea. They’re delicious when they’re fresh from the oven or after they’ve cooled, even for several days after they’ve been baked. 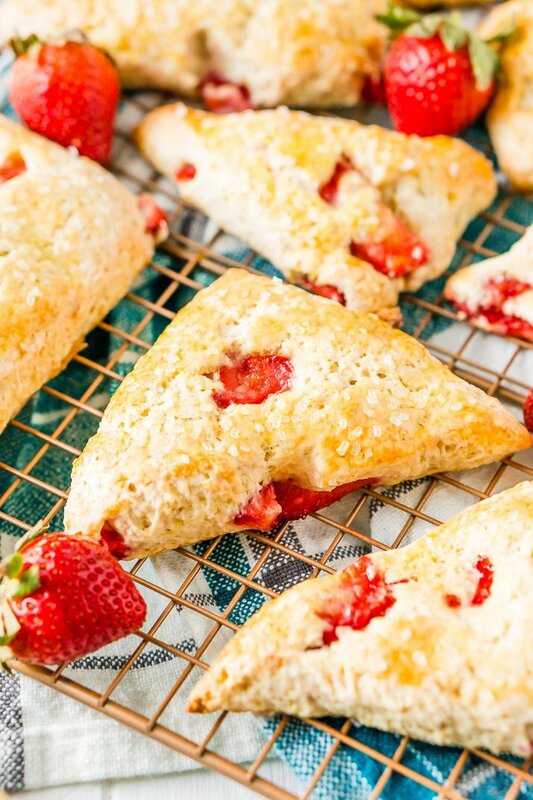 This easy Strawberry Scones recipe is full of bright, seasonal flavors. Chunks of juicy strawberries fill each bite, and lemon zest adds a pop of citrusy flavor that’s not too overbearing. On days when it’s too humid to drink something hot, savor a scone with a cold glass of iced tea or lemonade for a refreshing pick-me-up! These treats are also wonderful for breakfast when you’re on-the-go. I love packing a couple Strawberry Scones along with my to-go cup of iced coffee as I run out the door on balmy mornings. 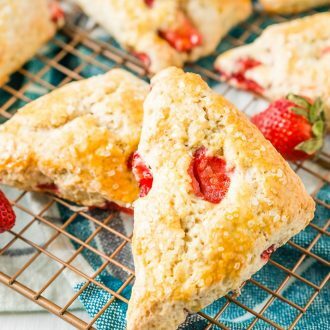 And if you have kids who just won’t get out of bed in time for breakfast, Strawberry Scones are a wonderful grab-and-go option to avoid starting off the day on an empty stomach. Even picky eaters will be pleased with the berry-filled goodness of this recipe! Anyone who knows me also knows I love brunch, and these are a wonderful addition to the meal, whether you’re hosting or going to someone else’s home. They’re especially good for warm-weather breakfasts when you want the food to stay light on a hot day. Sometimes, I even like popping them in the microwave for a few seconds and spreading on some butter – sooo good! 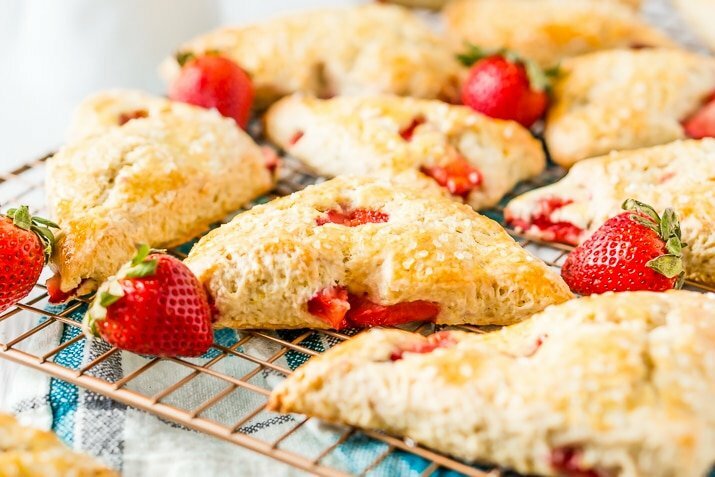 If you’re looking for an easy grab-and-go breakfast option or a satiating snack, try this sweet and citrusy Strawberry Scones recipe. Filled with the season’s best flavors, you’ll be enjoying these tasty treats all summer long! It is a small unsweetened or lightly sweetened biscuit-like cake made from flour, fat, and milk or cream and sometimes includes fruit. 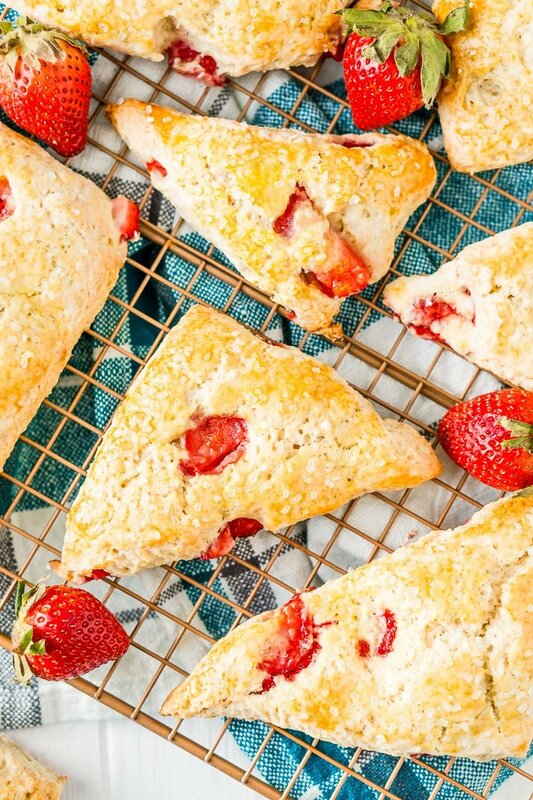 How Do You Make Strawberry Scones? Making scones is nowhere near as intimidating as it may seem and you don’t need any weird pans or tools to make them! Then, zest your lemon, you can reserve the rest of the lemon to juice and make a glaze with if desired. In a medium bowl, whisk together the sugar and lemon zest until the sugar turns yellow and fragrant. Next, add the flour, salt and baking powder to the sugar mixture and mix to combine. Then you’ll gently fold in the strawberries to the flour mixture and toss to distribute evenly. In a measuring cup, add the egg and enough heavy cream to fill 1 cup. Add vanilla extract and beat to combine. Make a well in the middle of the flour mixture and pour in the liquid mixture. Fold with a spatula or wooden spoon until a wet dough forms. You can add an addition tablespoon of heavy cream should the dough need a little more moisture. Turn the dough out onto a well-floured board, flour top of the dough and your hands, and pat the dough out about 1/2” thick. Fold the dough over itself and pat it out again, do this about 4 times. Shape the dough into a rectangle and roll it out to about 5”x8” or 6”x9”. Use a pizza cutter to cut the rectangle in half lengthwise, then cut in three crosswise to make 6 squares. Cut each square diagonally to make 12 triangles. Place the scones on a parchment paper-lined baking sheet, brush the top and sides with the egg white, and sprinkle with coarse sugar. Bake for 17 minutes until a toothpick inserted in the middle comes out clean. If you’d like to make a glaze, mix a tablespoon of lemon juice with 1 cup of powdered sugar and drizzle over the top of the scones. Pin this Scone Recipe for Later! First, zest the lemon. Reserve juice to make a glaze with if desired. Add flour, salt and baking powder to the sugar mixture and mix to combine. Add the strawberries to the flour mixture and toss to distribute evenly. If you'd like to make a glaze, mix a tablespoon of lemon juice with 1 cup of powdered sugar and drizzle over the top of the scones. You can add an addition tablespoon of heavy cream should the dough need a little more moisture. So just wanted to tell you I love your blog, am following you all over social media now, and you have stolen my heart with the strawberry scones. Two of my favourite things in this world are strawberries and scones. You have put them together. Thank you! Thank you, Debra, so glad to have you here!